3 Nights and 3 Championship Rounds on Blackmoor, Wachesaw East and International Club. Fill-Up the Golf-Tank with included daily breakfast at Webster's and Prebook Replays from $40. A truly unique option that includes playing at Blackmoor (the areas only Gary Player Signature course), Host courses for LPGA tournaments Wachesaw East and a classic Willard Byrd design International Club completes this unique coastal golf experience. 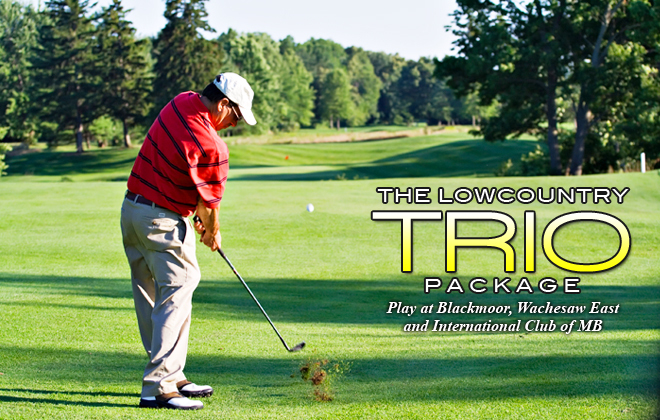 DISCLAIMER: From rate is based on quad occupancy in a 2 Bedroom Suite/Villa at Pawley's Plantation with rounds played at Blackmoor, International Club & Wachesaw East. Advertised from rate based on best available rate for each season. Rates will vary based on number of rounds chosen, stay dates and accommodations selected. Rates subject to change based on course availability. Black-out dates may apply. Taxes & Fees not included.